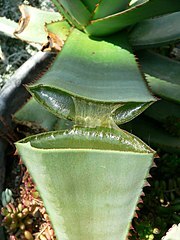 Succulent plants, such as this Aloe, store water in their enlarged fleshy leaves, stems, or roots, as shown in this split aloe leaf. This allows them to survive in arid environments. Aloe pron. : /ˈæloʊ/, also Aloë, is a genus containing about 500 species of flowering succulent plants. The most common and well known of these is Aloe vera, or "true aloe". The genus is native to Africa, and is common in the Cape Province, the mountains of tropical Africa, the islands of Africa including Madagascar, and the Arabian Peninsula. The APG III system (2009) places the genus in the family Xanthorrhoeaceae, subfamily Asphodeloideae. In the past it has also been assigned to families Aloaceae and Liliaceae or lily family. Members of the closely allied genera Gasteria, Haworthia and Kniphofia, which have a similar mode of growth, are also popularly known as aloes. The plant Agave americana, which is sometimes called "American aloe", belongs to Asparagaceae, a different family. Most Aloe species have a rosette of large, thick, fleshy leaves. The leaves are often lance-shaped with a sharp apex and a spiny margin. 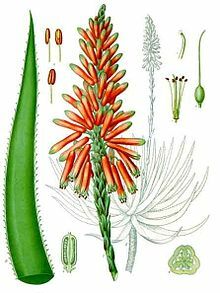 Aloe flowers are tubular, frequently yellow, orange, pink or red, and are borne, densely clustered and pendant, at the apex of simple or branched, leafless stems. Many species of Aloe appear to be stemless, with the rosette growing directly at ground level; other varieties may have a branched or unbranched stem from which the fleshy leaves spring. They vary in color from grey to bright-green and are sometimes striped or mottled. Some Aloes native to South Africa are arborescent. Aloe species are frequently cultivated as ornamental plants both in gardens and in pots. Many aloe species are highly decorative and are valued by collectors of succulents. Aloe vera is used both internally and externally on humans, and is claimed to have some medicinal effects, which have been supported by scientific and medical research[উদ্ধৃতিৰ প্ৰয়োজন]. The gel in the leaves can be made into a smooth type of cream that can heal burns such as sunburn. They can also be made into types of special soaps. Historical use of various aloe species is well documented. Documentation of the clinical effectiveness is available, although relatively limited. Of the 500+ species, only a few were used traditionally as a herbal medicine, aloe vera again being the most commonly used species. Also included are A. perryi and A. ferox. The Ancient Greeks and Romans used aloe vera to treat wounds. In the Middle Ages, the yellowish liquid found inside the leaves was favored as a purgative. [উদ্ধৃতিৰ প্ৰয়োজন] Unprocessed aloe that contains aloin is generally used as a laxative, whereas processed aloe vera juice does not usually contain significant aloin. Some species, particularly aloe vera, are used in alternative medicine and first aid. Both the translucent inner pulp and the resinous yellow aloin from wounding the aloe plant are used externally to relieve skin discomforts. As an herbal medicine, aloe vera juice is commonly used internally to relieve digestive discomfort. There have been relatively few studies about possible benefits of aloe gel taken internally. Components of Aloe may inhibit tumor growth. There have been some studies in animal models which indicate that extracts of Aloe have a significant anti-hyperglycemic effect, and may be useful in treating Type II diabetes. These studies have not been confirmed in humans. On May 9, 2002, the U.S. Food and Drug Administration issued a final rule banning the use of aloin, the yellow sap of the aloe plant for use as a laxative ingredient in over-the-counter drug products. Most aloe juices today do not contain significant aloin. Aloe rubrolutea occurs as a charge in heraldry, such as in the Civic Heraldry of Namibia. ↑ Images of aloe trees. ↑ "aloe for heartburn". Better Nutrition. 2007. http://findarticles.com/p/articles/mi_m0FKA/is_4_69/ai_n18791510. ↑ "aloe alt med". http://altmedicine.about.com/od/therapiesfrometol/a/heartburn.htm. ↑ "Aloe IBS study". http://www.medscape.com/viewarticle/546327. ↑ Cosmetic Ingredient Review Expert, Panel (2007). "Final report on the safety assessment of Aloe andongensis extract, Aloe andongensis leaf juice, Aloe arborescens leaf extract, Aloe arborescens leaf juice, Aloe arborescens leaf protoplasts, Aloe barbadensis flower extract, Aloe barbadensis leaf, Aloe barbadensis leaf extract, Aloe barbadensis leaf juice, Aloe barbadensis leaf polysaccharides, Aloe barbadensis leaf water, Aloe ferox leaf extract, Aloe ferox leaf juice, and Aloe ferox leaf juice extract". Int. J. Toxicol. খণ্ড 26 (Suppl 2): 1–50. doi:10.1080/10915810701351186. PMID 17613130. ↑ Tanaka M, Misawa E, Ito Y, Habara N, Nomaguchi K, Yamada M, Toida T, Hayasawa H, Takase M, Inagaki M, Higuchi R (2006). "Identification of five phytosterols from Aloe vera gel as anti-diabetic compounds". Biol. Pharm. Bull.=) খণ্ড 29 (7): 1418–22. doi:10.1248/bpb.29.1418. PMID 16819181. ↑ Food And Drug Administration,, HHS (2002). "Status of certain additional over-the-counter drug category II and III active ingredients. Final rule". Fed Regist খণ্ড 67 (90): 31125–7. PMID 12001972. ↑ "NAMIBIA - WINDHOEK". Archived from the original on 27 December 2007. http://www.ngw.nl/int/afr/windhoek.htm। আহৰণ কৰা হৈছে: 2008-01-24.